First Aid Online is the innovative market leaders in providing first aid products to businesses and industry of the highest quality. 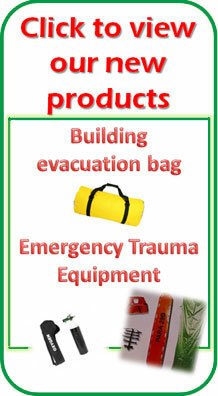 First aid online has developed and sourced a range of emergency equipment to enhance employee safety in the work place. We provide a range of safety gear including Safety Signs, Fire Extinguishers, Safety Shoes, Hard Hats, Gloves, Safety Bibs, Stretchers, Spine boards, Portable Oxygen and more. Medical emergencies can happen at any time. That is why healthcare professionals recommend First aid kits for homes, offices, vehicles and at the workplace. The best solution is to be prepared and to have a First aid kit handy at all times. First aid kits are a collection of supplies and equipment used to provide first aid. These kit's have different uses and may have different contents depending on the purpose. However, all First aid kits include items to perform basic first aid that ranges from minor injuries such as cuts, sprains and bites through to more serious injuries involving major trauma, heavy bleeding and CPR. First aid online are first aid kit suppliers have a range of First aid kits to meet your every need whether at work, at home, on the road, enjoying leisure activities or participating in sport. First aid kits in South Africa come in a range of sizes and styles. The carry bag is the most common but also they available in roll out bags, plastic boxes and metal boxes. 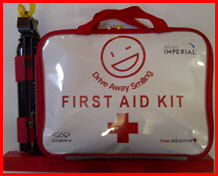 Carry bag First aid kits are easy to use and convenient to keep in your car or office. When an emergency occurs it is good to know you have a First aid kit handy. Why choose First aid online as your First aid kit suppliers as your choice? Simple, we supply the best value, quality and choice. Whatever your budget we are quality First aid kit suppliers with a selection that ranges from travel size kits to factory kits that meet legislative requirements for any business. We only supply First aid kits that carry proven equipment you can rely on. Very impressed with Fist aid kit Quality. Great products. First Aid Online is a company you can do Business with. What a pleasure to deal with people that care for their customers. Great product knowledge and after sale service. On time delivery every time. First Aid Online has helped our factory to get in line with legal requirements. The long-distance First Aid Bag is a absolute winner. Finally a bag designed for the Trucker. Thank you First aid Online for developing a First Aid Product that is to our satisfaction and to our customers approval.